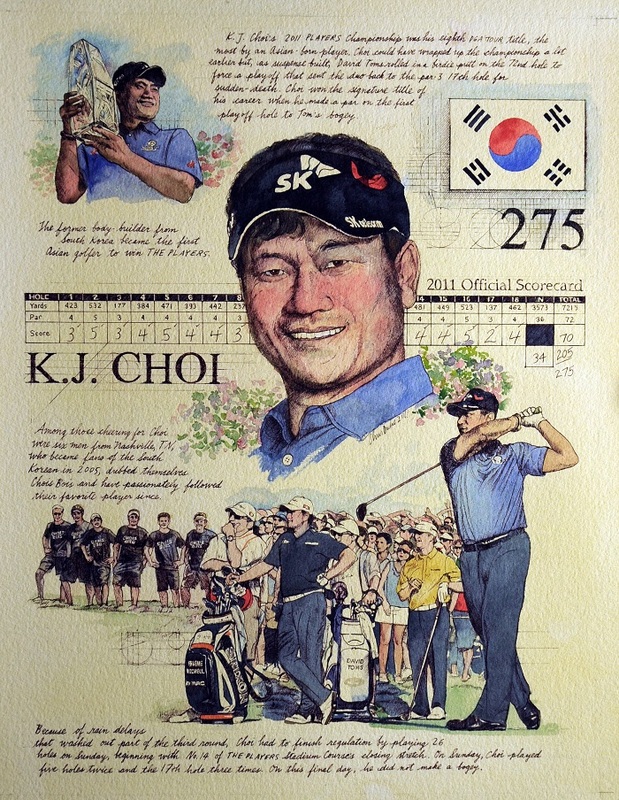 From South Korea, KJ Choi is Asia's most successful golfer and the winner of the 2011 PLAYERS Championship, his eighth Professional Golfers Association (PGA) title. The 2011 tournament was very tense. Due to inclement weather, Choi played 26 holes on Sunday. When Choi and David Toms ended up tied, the tournament was driven into overtime. Thus, Choi played the 17th hole three times on the Sunday of his win. In this piece, I loved including the other golfers awaiting Choi's swing – David Toms and Graeme McDowell. To see the sketch for this art as well as the Sawgrass clubhouse gallery where it hangs, please see my News update about K.J. Choi.